Cedarburg School District - Who's on First? "Who's on first. What's on second. I Don't Know's on third." One of the classic comedy sketches of all time is now transformed into a priceless picture book—and it's a great read for kids of all ages. Follow the mistaken identities, confusion, and lots of laughs as Rabbit and Bear act out this scene. 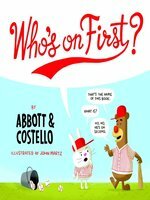 The book will appeal to Abbott and Costello fans, baseball fans, and anyone who enjoys funny banter-driven picture books. Illustrated in full color with slightly retro stylized illustrations. WILLIAM "BUD" ABBOTT and LOU COSTELLO are among the most famous duos in entertainment history. Together they starred in 36 films and made countless appearances on television and radio. In 1956, they were inducted into the National Baseball Hall of Fame and Museum in Cooperstown, New York. In 1999, Time magazine named "Who's on First?" the best comedy sketch of the 20th century. JOHN MARTZ is a cartoonist and illustrator who lives in Toronto with his wife and dog. John loves cartoons, comics, and comedy and grew up watching Abbott and Costello movies. He listened to "Who's on First?" so many times as a kid that he had it memorized. 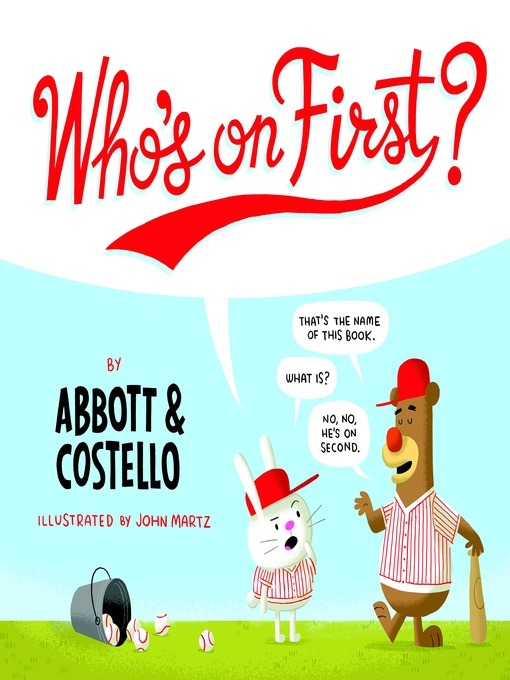 “Who’s On First?” is one of the crown jewels of our comedic cultural heritage, so a tip of the hat to Martz (Dear Flyary) for introducing a new generation to its glories. With source material so good, can any adaptation live up to expectations? Maybe not, but Martz does a solid job of translating the skit to picture book form. Abbott’s players with “some funny names” receive actual personas (Who is a snake, What is a blue dog, I Don’t Know is a chicken), and Martz breaks down the story into comics-style framing and speech bubbles. The rapid-fire rapport between Costello (a plump white rabbit) and Abbott (a big brown bear) is drained of some of its manic energy, and Martz’s stylized digital characterizations also dial down the real joy (and meta-meaning) of the skit: Costello’s high-pitched, escalating agitation in the face of Abbott’s gravel-voiced rationality and authority. So here’s the plan: play one of the many versions of the skit available online. Once those amazing voices and rhythms are ingrained in readers’ minds, read the book aloud. And be prepared to turn the pages—fast. Ages 7–up. Newsday "Martz's clever graphics make the premise clear to the youngest readers...Parents can now introduce the routine earlier than has been traditional for young fans and, as we all know, participating in tradition is the essence of the love of baseball." USA Today, 3 out of 4 stars "...miscommunications have never been so much fun." Sacramento Bee "...delightfully illustrated...If you have children who enjoy baseball or softball, this is a perfect complement to their personal library." Wired's Geek Mom "...cannot stop smiling...[this] delightfully illustrated take on the classic comedy skit by Abbott and Costello is for the young . . . and young-at-heart." The Talking Walnut "Who's on First? is a delightfully funny book with illustrations that bring the routine onto a new platform that even the youngest fan will understand and enjoy." Examiner.com "Your totz will be instant fans." Kid Lit Reviews "...this book's a hit with me"
Mollie Sultenfuss, Pages Books & Coffee, Newton, KS "A very funny read..."
Publishers Weekly "My twelve-year-old thinks both the words and the pictures are very funny and laughed out loud reading it."